Most buildings are porous and have the ability to absorb moisture, and when a property doesn't have an existing damp proof course, perished damp proof course, a bridged damp proof course or a bridged cavity, rising damp is likely to occur, or has previously occurred. The most important part is diagnosis of the problem, many people claim to be a damp specialist without any form of qualifications or understanding of traditional buildings. You will find there are many damp specialists that are approved contractors for a chemical company, this is often a 1 day training course. This doesn't make them a specialist in dampness investigations or even remedial works, and these so called damp specialists think everything is damp and offer a worthless guarantee. A damp meter is a great bit of equipment, but these are very difficult to understand. Damp meters are very sensitive to hygroscopic salts and simply getting a few high readings in the original lime plaster isn't enough evidence to start hacking off all the plaster. Most older buildings that still have the original lime mortar in place may have had rising damp come and go and this has deposited some of these salts on the wall-plaster which will give high readings. 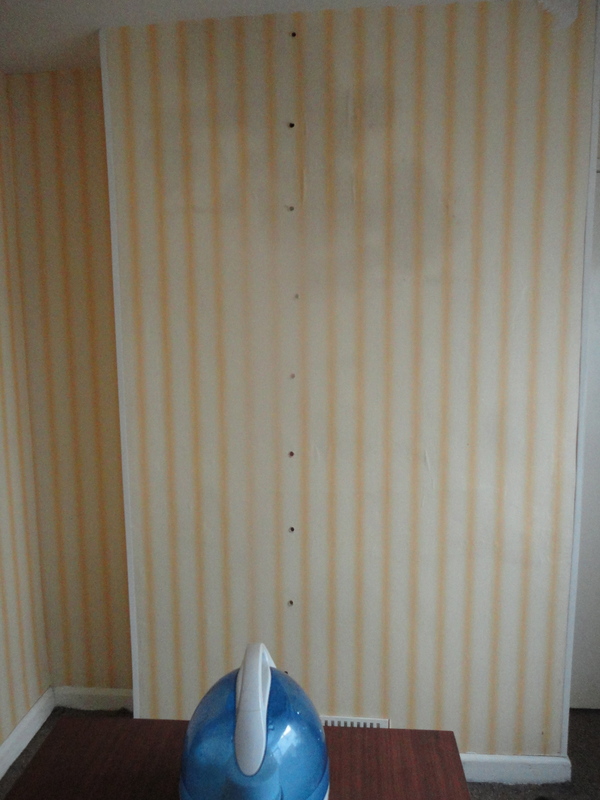 If you look at the picture below it shows that the old original lime plaster and wall paper have high readings, these are both dry. We also offer and would recommend that all damp surveys are a destructive investigation to BRE Digest 245, this is a vertical profile drilled into the wall where samples of plaster are removed for testing, we can then tell how much is moisture and how much is hygroscopic salts. Armed with this information only then can we offer the most suitable method of repair. A typical damp pre-purchase damp survey will consist of a non-destructive examination of the internal and external parts of the building looking for defects that could be causing the damp problems. Complete Preservation have all the latest equipment on the market which include moisture meters, thermal imaging cameras, boroscopes , endoscopes for drilling into cavity walls to check for bridging, hygrometers, infra red laser measurers and years of damp surveying experience. Our professional damp survey reports which are accepted by mortgage companies contain a assessment of any problems in the building and will include pictures of defects, cad sketch plans along with our recommendations and costs for any remedial work. The survey will always be carried out by a CSRT qualified surveyor and a member of the Property Care Association as instructed by your professional advisors. If a damp proof course is necessary it is installed in accordance to the British standard 6576: 2005.The damp proof course injection cream used by Complete Preservation has been awarded an Agrément Board certificate and conform to BS 6576: 2005 and the codes of practice of the BWPDA-Property Care Association of which Complete Preservations are members. All of our injected damp proof courses can be guaranteed and insured by Guarantee Protection Insurance (GPI). Complete Preservation are specialists in damp diagnosis to chimneys, we were the first people to carry out a time lapse video of hygroscopic salt damp on a chimney, a gravimetric profile to BRE Digest 245 and salt analysis and a thermal image clearing showing the hygroscopic salts. A moisture (damp) meter can't define between moisture and hygroscopic salts, that is why when there is a damp problem on the chimney breast the so called specialist roofers and builders always say its a leak. Have you got a damp stain on your chimney that you can’t seem to get rid of? Is it hygroscopic salts? Is it a leak? We have seen many cases where roofs have been repaired around chimneys a number of times and the other roofer-builder has said the other company didn’t do the lead work correctly, roof repairs, chimney repairs or the pointing etc etc and then they still have a damp stain on the internal chimney breast again and again. 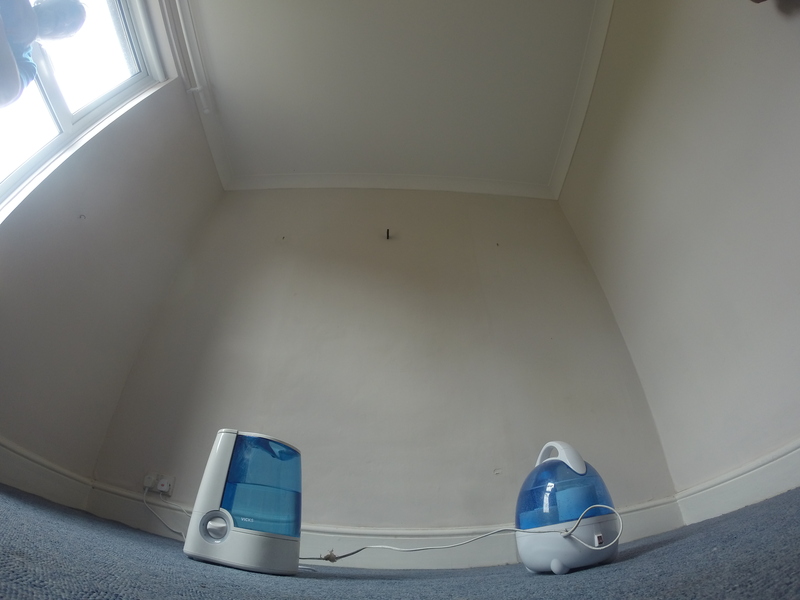 Recently I went to carry out a damp survey in Wiltshire, they had literally given up, this is how the story goes……. My client purchased a property 6 years ago, it was noted by the surveyor before purchase that the internal chimney breast had staining and the chimney probably needed small pointing works and further investigation was necessary. 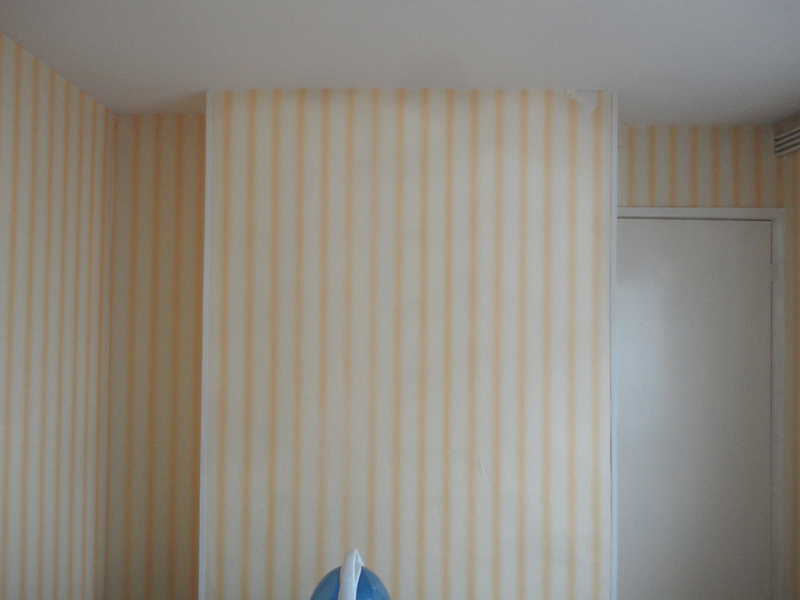 This work was carried out after they purchased the property in the summer and was decorated, a few months later on in the year the damp stains on the chimney breast came back, this time it was worse than before. So they called the roofer back in, he checked the chimney and tested it with a hose pipe and couldn’t see any problems….. he disappeared very quickly…….. They then called another roofer-builder, this guy pulls around on the lead flashing and seems to think the chase isn’t deep enough and also it needs a new roof, tells the client this is what needs doing, orders the scaffold and off we go again! The damp patch on the chimney seems to slowly shrink and disappear over the next few months, then its back again……… by this time my client said they couldn’t believe it. They then called the roofer out again and explained that the damp stain is back! He couldn’t find the cause and he disappeared very quickly like the last guy. Next comes the roofer with the all singing and dancing website, more professional, and more knowledgable, and he seems to think the chimney needs to be simply taken down and capped over with some ventilation. Seems like a good sensible idea they think……….A couple of weeks later the scaffold lorry turns up, up goes the scaffolding, up goes the roofers, down comes the chimney, this is then all capped off, vented and pointed and looks like a brilliant job. The damp patch doesn’t go and the roofer can’t seem to find the cause….same old story! You can imagine what my client was thinking now. By this time they had given up and thought they would have to put up with it. They then get some rising damp problems and contact a couple of damp proofers to come and carry out a survey, I then come along and have a chat about the high ground level causing the damp problem at the front, whilst looking at the front I said, “I see you’ve had a new roof then”, and bang….I get hit with it. And I said “thats probably salt damp” “Whats that” my client said, I then showed them a couple of case studies I had on dropbox. That was the Eureka moment for them. I went one better than that though, I showed them the damp patch grow, to do this I use a humidifier, this can produce high relative humidity quickly, give it 5-10 minutes you can see the damp patches grow. 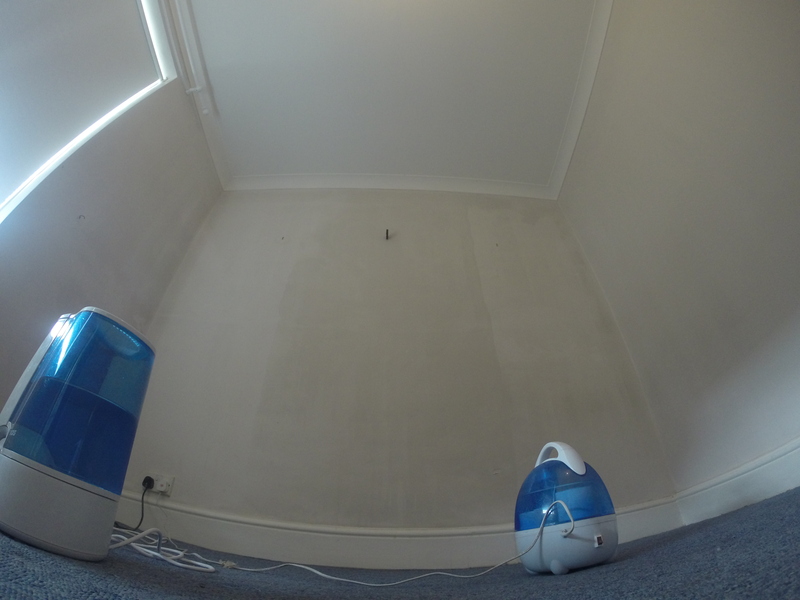 The below pictures show the humidifier in action raising the relative humidity of the room to show the hygroscopic salt damp patch growing. 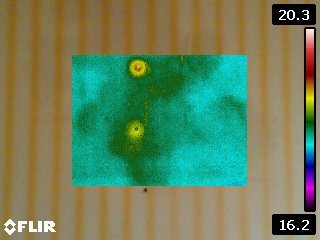 A picture in picture thermal image showing the dampness, note the holes are warm still from the drilling of the mortar samples. The below thermal image shows a difference in temperature between Sp1 and Sp2 being .3 degrees, this shows how powerful thermal imaging can be using temperature differences. My client now was convinced that the problem could be solved after spending literally thousands of pounds for nothing. All results were carried out to BRE Digest 245 giving us quantitative results and the client complete peace of mind. Salts analyses matched with the drilled profile and visible salt damp staining, this confirmed hygroscopic salts from long term burning of fossil fuels, and no free moisture which means that there is no leak in the roof or around the chimney and probably never was. Below is the before and after pictures of the time lapse showing the salt damp on where a chimney used to be in a property in Trowbridge Wiltshire. A penetrating damp survey will consist of a non destructive examination of the internal and external parts of the building looking for defects to find the exact cause of the problem. Most penetrating damp problems are caused by defective pointing, leaking gutters, defective cracked rendering, porous bricks and stones or even a particular wall that has driving rain against it. 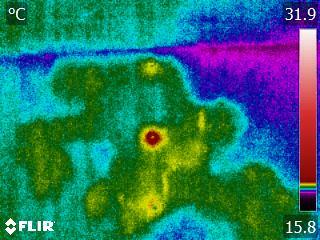 Thermal imaging is great for finding the causes of penetrating damp, this can be identified as a cold spot on the wall. Repairs for re-pointing on traditional buildings need to be carried using lime mortar to match the existing, and all external render on traditional buildings is recommended to be replaced with lime mortar-render. Complete Preservation can carry out the traditional lime repair works and advise on the best solution for the problems. Hard cement pointing can also cause penetrating damp, if the pointing is really hard it will trap in the moisture from from wind driven rain and slow any evaporation by the sun and wind. Solid stone walls that have penetrating damp problems can sometimes be because of voids in the walls that allow the penetrating damp to find a path, this will literally run through the wall and normally comes out above windows. We offer a grouting system for this to make the wall solid again, so it will act as when it was first constructed. A survey for this will consist of resistance drilling and a boroscope inspection of voids to determine the extent of grouting necessary. We also use a product called Stormdry, this product stops rain penetration, saves energy and improves flood resistance, this product is scientifically proven to reduce heat loss in single skin masonry construction with an energy saving of up to 29%. This product is also used to combat condensation problems, as the walls are drier and warmer condensation problems are less likely to occur. Stormdry is a colourless, breathable, water-repellent treatment for brick, concrete and stone walls, it is applied by roller, brush or spray and is UV resistant resulting in a life expectancy of 20-30 years. Our professional damp survey reports contain a comprehensive assessment of any problems in the building and will include pictures, computer generated drawing of the property along with our recommendations and costs for the remedial work. The Survey will always be carried out by a CSRT qualified surveyor and a member of the Property Care Association as instructed by your professional advisors. Condensation accounts for a large proportion of the damp problems in England, it is often misdiagnosed for rising damp. This is why it's extremely important to use a damp specialist that can tell the difference between the different types of damp. Complete Preservation also carry out data logging of the environment, we measure the temperature, relative humidity and dew point and is normally recorded every five minutes for a few weeks, this is then downloaded into our computer system to get definitive answers. Complete Preservation also supply and install Nuaire extraction fans for bathrooms and kitchens to control condensation at source. Do you suffer from hay fever or asthma? We also install Nuaire positive input ventilation systems which can help cure condensation problems as they introduce fresh filtered air into the property, we also install these for people that suffer from hay fever and asthma as the air is filtered and clinically proven to help allergy and asthma sufferers. Our system is a unique low energy, loft mounted Positive Input Ventilation system providing year round whole home ventilation that can help to heat or cool the home, whist curing condensation dampness and improving indoor air quality. We are Bpec qualified in domestic ventilation systems. The unit is totally automatic and intelligently decides what location to supply the air from. This is particularly useful in warmer weather when a conventional unit would have switched itself off due to high loft temperatures. During colder months, if the temperature in the loft is warmer than that in the home our system will increase its airflow automatically and deliver even more free heat into the home, reducing energy bills. Year round ventilation and the optimum indoor temperature - integral sensors and automatic control adjusts fan operation to maximise heat recover or summer cooling. • Cures condensation dampness - PIV removes humidity from the air, preventing mould growth and controlling dust-mite allergens. • Improves indoor air quality - indoor pollutants from cooking and cleaning are removed while outdoor pollutants including traffic fumes, pollen and Radon gas are kept out. • Meets Regulations - meets Part F & L of Building Regulations as a low-energy ventilation strategy. • Health benefits - clinically proven to help allergy and asthma sufferers. • 5 year warranty - for peace of mind. Complete Preservation have all the latest equipment on the market which include moisture meters, thermal imaging cameras, boroscopes, endoscopes, hygrometers, infra red laser measurers and years of professional experience. Our professional Condensation survey reports contain a comprehensive assessment of any problems in the building and will include pictures, digital drawing of the property along with our recommendations and costs for the remedial work. The Survey will always be carried out by a CSRT qualified surveyor and a member of the Property Care Association as instructed by your professional advisors. Basement waterproofing needs to be carried out to "BS8102: 2009" which is the code of practice for protection of below ground structures against water from the ground. It is very important when choosing a basement, cellar, vault waterproofing specialist that they are trained professional members of the Property Care Association and hold the CSSW qualification, there are only 300 of these in England. Our professional basement waterproofing survey reports contain a comprehensive assessment of any problems in the building and will include pictures, computer generated sketch plans of the property along with our recommendations and costs for the remedial work. The Survey will always be carried out by a CSSW qualified surveyor and a member of the Property Care Association as instructed by your professional advisors. Contact us for basement dig outs, underpinning in Bath, Wiltshire, Somerset, Bristol, Swindon, Gloucester, the South West. Make sure you read our blog on basement and cellar waterproofing designs. Complete Preservation are Basement Waterproofing Specialists covering Trowbridge, Bath, Swindon, Devizes, Chippenham, Marlborough, Frome Bristol, Wiltshire, Somerset and the South West. We have years of experience in sprayed cementitious tanking systems and the more modern cavity membrane pumped systems and with our CSSW qualification you can be assured of the most suitable designed system installed to the highest standards.